B: Perhaps they've won already? 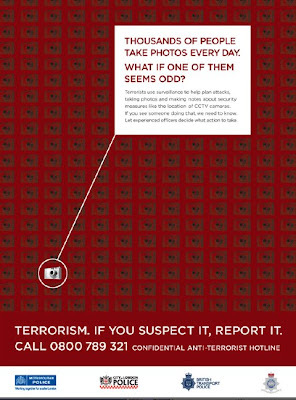 When you're finished reporting the photographer, here are some other suspicious activities to call about. We need everyone's cooperation on this or else the terrorists win. In Paris in the Marais District, I was photographing a building by Hector Guimard when I felt a hand on my shoulder and a voice saying you can't take a picture of that building. I told the guy the building's not a secret and pulled out my guidebook, which contained a picture of the building. I didn't argue, but returned the next morning, when the light was better. Still, I often harbor the feeling that what I'm doing might be construed as suspect by someone. We "live in interesting times", as the Chinese say or curse. So far I remain undaunted.